Sunday morning fog caused about 46 flights scheduled to land at Denver International Airport to be diverted, airport officials said. The GOES-R IFR Probability field gave useful anticipatory information for this event. The animation above shows a line of high IFR Probability moving southward and westward. Stations within the highest IFR Probability reported freezing fog (e.g. Sidney Nebraska (KSNY) at 0800 UTC, Akron, CO (KAKO) at 1200, 1300 and 1400 UTC and Kit Carson Airport in Burlington CO (KITR) at 1400 UTC). When the region of higher IFR Probability abuts up against Denver International (KDEN), then, at 1600 UTC, the Freezing Fog that occurred should not surprise. This region of enhanced IFR Probability persisted near Denver International through 2200 UTC. For comparison, the Brightness Temperature Difference Field is shown above. Terrain-induced cirrus clouds largely obscured the view of low clouds from satellite in this case. Thus, the incorporation of surface information via the Rapid Refresh model was key to producing an IFR Probability field with useful content. Visible Imagery from GOES-13 (below) and GOES-15 (bottom) show the cirrus and the underlying low clouds. The steady southward advancement of the low clouds is consistent with the motion of the IFR Probability fields. This entry was posted in Plains, Rocky Mountains on November 30, 2014 by Scott Lindstrom. In the image above, a trough of low pressure is depicted along the Mississippi River, with moist southerly flow over the Ohio Valley and Western Great Lakes (Dewpoints in Wisconsin at this time were mid- to upper-40s (Fahrenheit). This moist air is easily cooled to its dewpoint by the underlying cool ground, and dense fog is a result. However, this fog is difficult to detect from satellite because of the multiple cloud layers that accompany low pressure systems. GOES-R IFR Probabilities show a good signal because of Fog Predictors that are derived from numerical model output (the numerical model used is the Rapid Refresh). In this case, the Rapid Refresh was accurately depicting the evolution of the system because the model-based field of IFR Probabilities accurately overlaps the region of observed IFR (and near-IFR) conditions. This entry was posted in Midwest, Multiple Cloud Layers on November 23, 2014 by Scott Lindstrom. The traditional method of detecting fog/low stratus from satellite data, the brightness temperature difference between the longwave and shortwave infrared channels (10.7 µm – 3.9 µm on GOES) can overpredict regions of reduced ceilings and visibilities because satellites see only the top of the cloud. GOES-R IFR Probabilities, in contrast, incorporate surface-based information into a fog/low stratus predictive algorithm. As a result, regions with elevated stratus (such as eastern/northeastern Oklahoma in the toggle above) that should not affect transportation (for example) can be screened out of a field meant to diagnose regions of reduced visibilities. This entry was posted in Plains on November 21, 2014 by Scott Lindstrom. A strong cold front moved through the deep south in the early morning of 17 November 2014, accompanied by low ceilings and reduced visibilities that were very close to IFR conditions. Multiple cloud layers, however, prevented brightness temperature difference fields from diagnosing the low clouds. In cases such as these, a data fusion product such as GOES-R IFR Probability that incorporates surface information via a model simulation (such as the Rapid Refresh) that assimilates surface data is still able to highlight regions where IFR Conditions are most likely. In the animation above, flat fields (those that are horizontally homogeneous, such as over central Mississippi at 0315 UTC) are regions where multiple cloud layers prevent the identification of low cloud features and GOES-R IFR Probability is therefore computed using model-based predictors only. Regions over Louisiana at the beginning of the animation are more pixelated in appearance. This is a region where high clouds have pushed off to the East, where satellites can observe the behavior of low stratus and where satellite data can therefore be used as a predictor in the GOES-R IFR Probability algorithm. Regions where satellite data cannot be used generally have lower probabilities because one of the predictors (satellite data) is absent. That is the case in the above animation. When satellite data can be used, IFR Probabilities increase. Use that knowledge of the behavior of IFR Probability fields to tailor your interpretation of the magnitude of the IFR Probability. This entry was posted in Deep South on November 17, 2014 by Scott Lindstrom. 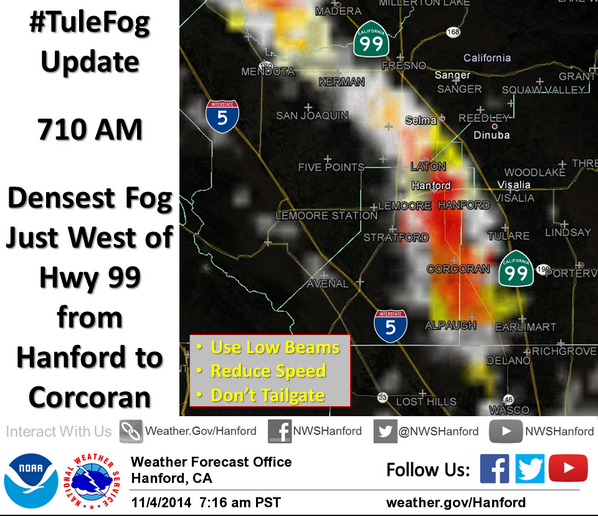 The National Weather Service in Hanford tweeted the image, above, of IFR Probability this morning. How did the evolution of IFR Probabilities compare to that of brightness temperature difference fields? The hourly animation, below, suggests that data from the Rapid Refresh model was likely crucial in determining exactly where the lowest visibility occurred; the brightness temperature difference field did not capture the horizontal extent of the narrow band of fog that developed to the east of Interstate 5 (The interstate is the purple line in the animation). Indeed, the brightness temperature difference field appears to offer little in the way of forecast value, and differences trend to zero as the sun starts to rise at the end of the animation. In contrast, both IFR and LIFR Probabilities have peak values where ceilings are obscured and visibilities are near zero, in and around Hanford, and those large values persist through sunrise. Suomi NPP overflew the central Valley at 0938 UTC. The Day Night Band and the brightness temperature difference (11.45µm – 3.74µm) field, below, do not contain signatures of dense fog near Hanford. The two-hour time-lapse video, below, shows the evolution of the Fog at the National Weather Service Office in Hanford on the morning of 4 November. This entry was posted in California, Day/Night Band, Suomi/NPP on November 4, 2014 by Scott Lindstrom.